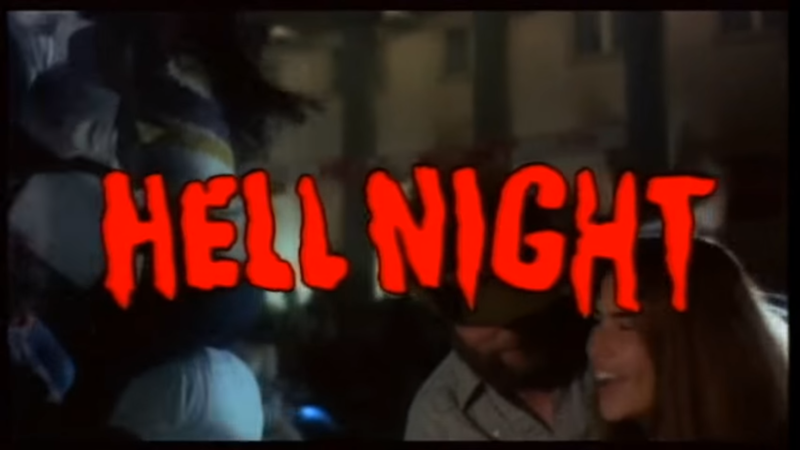 Hell Night has long been on my to-watch list, but has somehow always been put on the back burner. But after watching this video, everything that I already knew was confirmed: sororities are scary as hell. Thankfully, this 1981 slasher is much more tolerable than the real deal. Actually, I rather enjoyed the heck out of this movie. Marti (Linda Blair) is one of the newest pledges to a sorority on campus. She’s joining another girl, Denise, and two boys from Alpha Sigma Rho for an initiation night. Or, as the president Peter calls it, Hell Night. For their initiation, the four kids have to “guard” Garth Manor. The manor was abandoned after a man killed his family and then hung himself. The four children of Raymond Garth were all deformed and brought him shame. But the body of the youngest child, Andrew, was never found by police. Rumour is, Andrew still is somewhere in the house. The four initiates are left at the gates and locked in with a padlock. Peter tells them that the only way they can get out is by shooting the lock with the gun he’s supplied or to climb over the tall fence, but given the gate’s height and sure-to-impale spikes on top, it’s not exactly a realist option of escape. So the four kids settle in for the night, awaiting the dawn so that they can leave. Denise immediately gets her own party started by introducing quaaludes and whiskey into the mix. Surfer boy Seth is immediately into it (or, in his words, “radical”) and the two pair off up to a bedroom to get better acquainted. Without their counterparts, Marti and Jeff (played by the gorgeous Peter Barton) are left with each other to bond. Unbeknownst to the group, three of the frat members are preparing to torment them. Marti and the other three are startled when they hear a girl’s screaming and the moaning of a ghost. The boys quickly suss out that there are speakers wired up throughout the house and they dismantle one of them. Peter realises that one of his pranks is over and sends out May, a sorority sister, out to start the distraction for their next joke. She’s angry, but eventually relents and beings to walk away. But before she can get very far, she’s grabbed by a pair of hairy arms reaching up from a vent, and is dragged down before being beheaded. Peter’s friend Scott follows soon after and has his neck snapped while he’s setting up a prank on the rooftop. Peter is oblivious to his friends’ absence and continues to terrorise the four in the house (including a hilarious scene with Denise checking herself out in a mirror). The fraternity president eventually realises something is amiss and begins to look for Scott and May, he finds Scott first – or what’s left of him. Startled by his friend’s corpse, Peter tries to run away, and runs into a hedge maze. But he’s soon caught up to by the assailant and killed with a scythe. With the outdoor students gone, the killer turns his attention to the four inside. Denise goes missing while Seth goes to the toilet. When he pulls back the bedsheets, he finds May’s head in his bed. When he screams, Jeff and Marti run to his aid, and after seeing the head as well – all three run to the gates. But after firing the gun, Seth realises that the gun they’ve been given is filled with blanks. Seth braves the gate and manages to climb over it relatively unscathed. He promises to go to the police and bring back help for his friends. Despite doing the stupid thing and going to the frat house first, he eventually goes to the station but is turned away. No worries, though. He steals a gun. Marti and Jeff are left to fend for themselves and look for Denise. They find Scott’s body hanging by the window and realise that they are probably going to die. They are attacked by a figure under a rug, but the person escaped by dropping down through a trap door. Reluctantly, the two kids follow. In the tunnels, they find Denise’s body at a dinner table full of corpses that are, unfortunately, not really explained. I think it’s meant to be the Garths, but considering the story told about the bodies being found and carried away, I’m not too sure. Any way. Denise is dead. But Seth is on his way with a stolen vehicle and a stolen gun! He’s attacked by the figure, but he manages to shoot him. Doesn’t matter, because this person (who is definitely the missing child, Andrew) is made of the same magic as Jason Voorhees, he survives and kills Seth in his moment of victory. Jeff and Marti try to escape as well. Marti climbs up onto the roof top out through a window, but Andrew helps Jeff out by simply throwing him out the window to his certain death. It is slightly sad that Marti + Jeff doesn’t last, but this is a horror film and all tropes must be adhered to. The final girl makes her way into the hedge maze where Peter was killed. She finds his corpse and manages to get the gate keys out of his hands. She unlocks the gate and gets into Seth’s stolen car. But she panics too much and drives INTO the gate (silly cow). When she does finally manage to start her escape, she’s attacked by Andrew. She has the bright idea to drive the car straight into the broken gate, and manages to impale Andrew onto the top. She passes out and wakes up at dawn to see Andrew still dead. She walks away dazed, and into the sunset (probably). To say that Hell Night is particularly unique or fresh is probably selling it a bit too much, but it does feel like it’s different. The setting and costumes (the party is done in fancy dress/Halloween costume style) is very cool and makes the film a touch more atmospheric. I do love seeing Blair in things. She’s really great, even if she was nominated for a Razzie for worst actress. In the realm of sorority school slashers, Hell Night stands above most. It’s a bit silly, but it still manages a few good scares. In Seth’s catchphrase, I think this movie is rather radical.